Machine vision cameras must perform two very different functions superlatively well: deliver images of very high fidelity and operate seamlessly with the machinery and control system with which they are embedded. In addition to providing unparalleled image fidelity Opteon cameras respond faster and more deterministically than any other cameras available, triggering the exact microsecond your system needs them to act. Absolutely everything about how each image is taken can be changed deterministically between every frame even when images are being delivered at the rate of hundreds of images per second from dozens of cameras simultaneously. Opteon devices also communicate their status at every step of generating each image and monitor the delivery of every pixel of every image all the way to the computer memory allocated for your application’s use. Your application will be notified immediately if anything in the computer or network prevent any communication of triggers or commands to the camera or image data back to the host computer arriving on time. Queries are provided that will allow diagnosis of network faults to the failing port or even cable conductor. 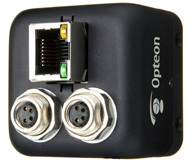 Opteon cameras can energize any lighting devices connected directly to them, or to Opteon networked lighting controllers. Either way synchronization and control of the lighting environment is managed precisely to assure lighting stability to one tenth of one grayscale, shot-to-shot. Avoiding parochial communication standards will assure your machine vision systems will operate smoothly with all other portions of your machine and your designs will have much greater longevity. Transactions between system elements and the host including image delivery take place at the right place in modern computers – user-mode virtual memory, and are invariant regardless of the media used to implement the communication, ex: USB, Ethernet, etc. Powerful, flexible .Net objects may be used to facilitate rapid, flawless, control of all aspects of your machine vision system so they are tightly integrated into your applications. Using Opteon's .Net objects means that your application will be unaffected by any changes you may choose to make in the selection of cameras, light sources, sensors, or machine controls. Opteon supplies a wide variety of area scan, line scan, and tri-linear cameras with the optimum number and size of pixels for your application, and with a wide range of speed grades, and communication alternatives. Opteon cameras are limited only by the physical limitations of the lights and lenses used to create and propagate photons for your inspections to the camera. All Opteon cameras are Optical Schott noise limited. Their electronic noise is orders of magnitude below the irreducible, Gaussian variation in the number of photons that will be delivered by the optics to each pixel in the camera. The contract between the camera and the image analysis algorithms is that the grayscale reported for a pixel is no more and no less than proportional to the number of photons that arrived at that photo-site for every level of brightness. Opteon cameras are very linear in their response to light and they also have perfect spatial fidelity. Unlike other cameras, there is no bleed of data between nearby pixels. Image analysis algorithms deliver more precise answers from images provided by Opteon cameras. Accurate control of the light is just as important as the fidelity of the camera to generating high fidelity images for analysis. That’s why Opteon cameras can completely manage any lights connected to them. All Opteon cameras are optionally available with one or even two independent light controllers each capable of delivering 480W of precisely controlled energy to each light so that the average grayscales of successive images of the same target are consistent to within a tenth of a grayscale.